ევროკავშირისა და გაეროს განვითარების პროგრამის ერთობლივი ინიციატივა COBERM -III-ის მიერ მხარდაჭერილი სამედიცინო პროექტის - „დავამარცხოთ ვირუსები, დავძლიოთ უნდობლობა და ვაშენოთ მშვიდობა“ -ს მიმდინარეობასთან დაკავშირებით 2016 წლის 15 დეკემბერს ასოციაცია „მშვიდობიანი და საქმიანი კავკასია“-ს (ამსკ) სააქტო დარბაზში შედგა საინფორმაციო შეხვედრა ქუთაისის კლინიკების წამყვან ექიმებთან. შეხვედრას უძღვებოდა ამსკ-ს დამფუძნებელი და პროექტის დირექტორი ალუ გამახარია. მან შეხვედრის მონაწილეებს გააცნო პროექტის იდეა, მიზანი და ამოცანები. მიაწოდა ინფორმაცია პროექტის მიმდინარეობის შესახებ. ხაზი გაესვა, რომ პროექტს მხარს უჭერს ევროკაცშირისა და გაეროს განვიტარების პროგრამა, მათი ერთობლივი ინიციატივა COBERM–ი. ისაუბრა COBERM-ის პრიორიტეტებზე, რომლის თანახმად წარმოდგენილი პროექტი ორიენტირებულია აფხაზეთში და სამხრეთ ოსეთში მცხოვრები, ძირითადად საქართველოს მოქალაქეობის არ მქონე, ყველაზე მოწყვლადი ჯგუფის (ავადმყოფების) ჯანმრთელობის გაუმჯობესების ხელშეწყობაზე.პროექტი ითვალისწინებს ბენეფიციარების ამ ჯგუფისთვის კვალიფიციური სამედიცინო მომსახურების ხელმისაწვდომობის გაფართოებას. აღინიშნა, რომ ეს პროექტი ხელს უწყობს დაყოფილ თემებს შორის ურთიერთობების აღდგენას, ნდობის მშენებლობას. პროექტის განხორციელების 1-ეტაპზე (15.08-15.11.2016წ) ამსკ-მ და თბილისში მისმა პარტნიორმა ორგანიზაცია „საზოგადოება მომავალი თაობისათვის“ (SFG) კვალიფიციური სამედიცინო მომსახურება გაუწიეს კონფლიქტების ზონებში მცხოვრებ 152 პაციენტს, ნაცვლად გეგმით გათვალისწინელი 120-სა. ქუთაისში აფხაზი პაციენტების მონაწილეობით ტარდება შეხვედრები, დიალოგი და მასტერ-კლასები ცხოვრების ჯანსაღი წესების დანერგვას, რაციონალური და სრულფასოვანი კვების საკითხებთან დაკავშირებით 2 და 5 დეკემბერს. აფხაზ პაციენტებს ჩაუტარდათ გამოკვლევები უჯრედოვან დონეზე ფუნქციური კვლევის მეთოდით და მათ სამახსოვროდ გადაეცათ ბროშურები: „ჯანმრთელობის საიდუმლო“ და 2017 წლის მთვარის ასტროლოგიური კალენდარი. ძალიან საინტერესო იყო პროფესორ ნატა თოდუას მიერ აფხაზების მონაწილეობით ჩატარებული მასტერ-კლასი, ჯანსაღი კვების კონკრეტული ნიმუშების დამზადებით და დაგემოვნებით, რამაც აფხაზი პაციენტების დიდი მოწონება გამოიწვია. ითქვა, რომ საერთოდ, კონფლიქტური რეგიონების თემებთან ნდობის მშენებლობა გრძელვადიანი პროცესია. ამიტომ COBERM III-ის ფარგლებშიც უკვე მიღწეული შედეგების შენარჩუნებას და მის განმტკიცებას უზარმაზარი მნიშვნელობა აქვს და ამას პროექტის მენეჯმენტი და ქართველი ექიმები განსაკუთრებულ მნიშვნელობას ანიჭებენ. მიწოდებული კვალიფიციური სამედიცინო მომსახურება, გადარჩენილი სიცოცხლე, გაუმჯობესებული ჯანმრთელობა ადამიანებს დიდ ხანს არ ავიწყდებათ და ის მომავალ თაობებსაც გადაეცემათ... დაპირისპირებულ თემებს შორის გაზრდილი ნდობა და დამყარებული ურთიერთობები ბადებს კიდევ უფრო მეტი ახალი კავშირების დამყარების, ნდობის შემდგომი ამაღლების მოთხოვნილებას. ყოველწლიურად იზრდება აფხაზების მომართვები მკურნალობაში დახმარებისათვის. ასევე, მატულობს ერთი და იგივე ადამიანების განმეორებითი მომართვების რაოდენობა, რაც აშკარად ნდობის ამაღლებაზე მეტყველებს. მიმდინარე სამედიცინო პროექტის და სხვა მსგავსი ინიციატივების შედეგად, დროთა განმავლობაში იზრდება იმ ადამიანების რიცხვი, რომელთაც აწყობთ კონფლიქტის სრული მოგვარება. ამიტომ, ამსკ ცდილობს , რაც შეიძლება მეტი აფხაზი/ოსი პაციენტების სრულყოფილი მომსახურება შეძლონ ქართულმა კლინიკებმა. ექიმებმა ცალსახად განაცხადეს, რომ ისინი კარგად აცნობიერებენ ამ მიმდინარე სამედიცინო-ჰუმანიტარული პროექტს, ნდობის აღდგენაზე მის დიდ გავლენას. ისინი გამოხატავენ მზადყოფნას, მაქსიმალურად ხელი შეუწყონ თავიანთ კლინიკებში აფხაზი /ოსი პაციენტების მაღალხარისხიან სამედიცინო მომსახურებას, მათ შორის, შესაძლოა ეს გაკეთდეს ყოველგვარი ანაზღაურების გარეშეც. ასევე ითქვა, რომ აფხაზი და ოსი პაციენტებისთვის ქართულ საზოგადოებაში სოციალური ფილანტროპიის კიდევ უფრო განვითარებისათვის და სამედიცინო მომსახურების ალტერნატიული ფინანსური რესურსების მოძიება/მოზიდვაზე უნდა გაგრძელდეს აქტიურად მუშაობა. ექიმებმა დაათვალიერეს ამსკ-ს ოფისის მესამე სართულზე პაციენტებისათვის მოწყობილი საოჯახო ტიპის ღამის სათევი ოთახები და გაესაუბრნენ აფხაზ პაციენტებსაც. ღონისძიების დასასრულს მადლობა გამოეცხადათ ექიმებს აფხაზეთიდან ჩამოსული პაციენტებისადმი გაწეული კვალიფიციური სამედიცინო მომსახურების, ნდობისა და მშვიდობის მშენებლობის საქმეში მნიშვნელოვანი წვლილის შეტანისათვის და მათ გადაეცათ სიგელები, მადლობის წერილები. ღონისძიებას ესწრებოდა და იღებდა „ სტუდია რე“-ს თავმჯდომარე მამუკა ყუფარაძე და ჟურნალისტი მაია შონია. APBC founder and project director Alu Gamakharia conducted the meeting. He informed the audience about project's idea, goals, objectives, and its progress. 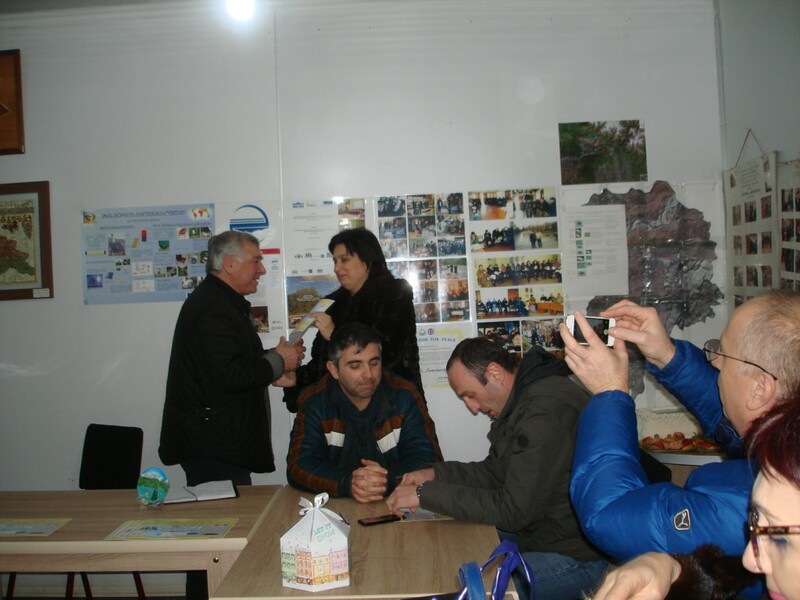 It was emphasized that project is supported by EU and UN development program initiative COBERM. He spoke about COBERM priorities, according which Project is oriented to improve the health of the most vulnerable groups of people, who live in Abkhazia and South Ossetia and do not have Georgian citizenship. One of the project objectives is to widen accessibility ranges of qualified healthcare, for the latter group of beneficiaries. It was noted, that this project will increase confidence building and reestablish relationships between separated communities. 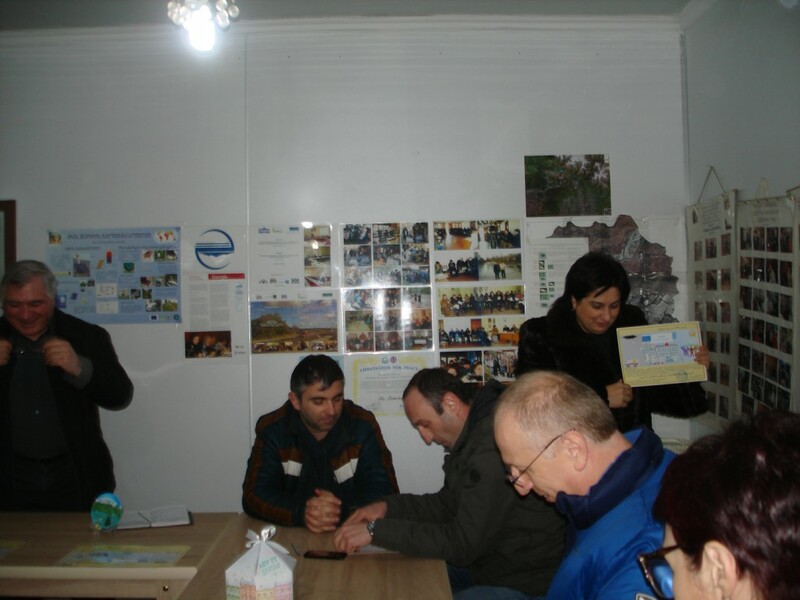 During the 1st stage of the project, APBC and its partner organization in Tbilisi SFG (society for future generations) provided 152 people (instead of planned 120) who live in conflict zones with qualified medical care. 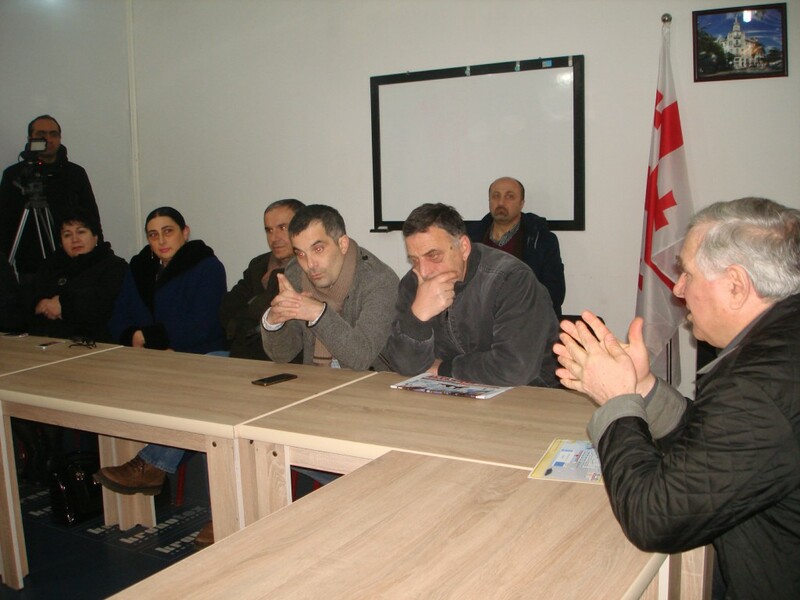 Meeting, dialogues and master classes, regarding healthy lifestyle and balanced nutrition intake, with the participation of Abkhazian patients, are organized in Kutaisi. On 2nd and 5th December Abkhazian patients had examinations on cellular level, with functional method and brochure "Secret of Healthy life" and 2017 moon astrological calendar were handed out. 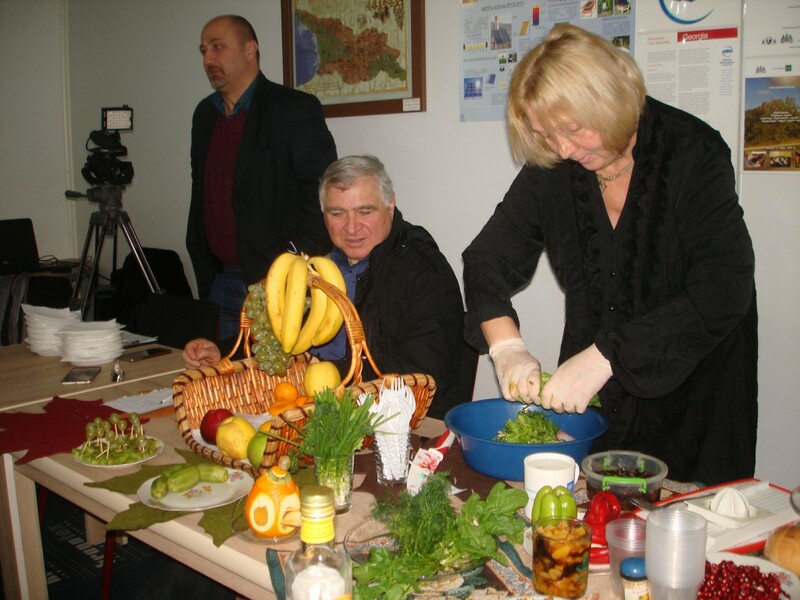 Professor Nata Todua Master Class, where Abkhazian patients participated in healthy food preparation and taste sampling, was met with great approval from patients. It was said, that Confidence building with conflict zone communities is a long-term process, therefore it is of utmost importance to maintain and consolidate already achieved results by COBERM III. Project management and Georgian doctors consider this as vital goal. Delivering qualified medical care, saving the life, improving the health _ such things are not easily forgotten by people even after generations... Increased confidence and established relationships between opposed communities create further possibilities for more connections and trust. In addition, same patients turnout has increased, which obviously shows increased confidence. As a result, of current project and other similar initiatives, the number of people who would like this conflict to be finally resolved is increasing. Therefore, APBC tries to provide as many Abkhazian/Ossetian patients as possible with qualified medical care at Georgian hospitals. Doctors unambiguously stated that they fully realize the great influence of current medical-humanitarian project, over the confidence building. They are ready to support high quality treatment for Abkhazian and Ossetian patients, may be even pro bono. It was also said that efforts to find alternative financial sources and to develop social philanthropy should be actively continued. 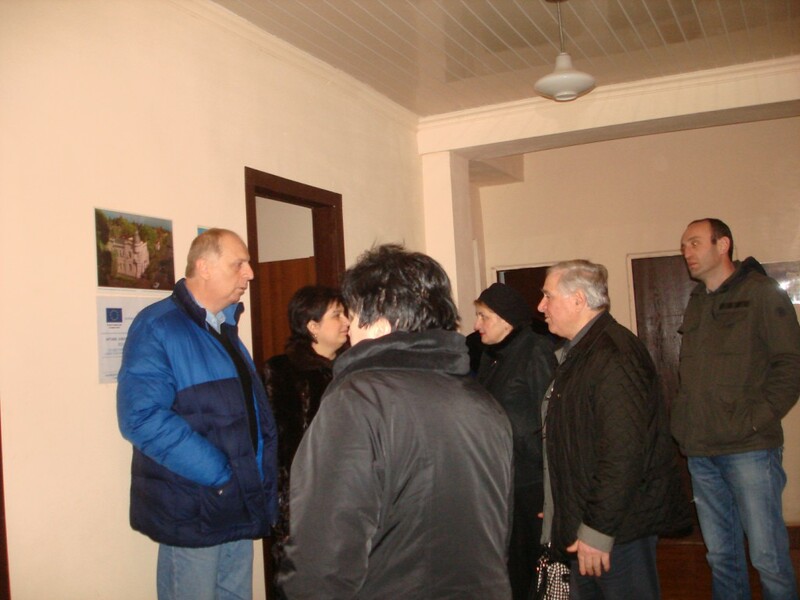 Doctors saw ABPC office accommodation block and spoke with Abkhazian patients. At the end of the event, doctors' deeds were acknowledged one more time. They were rewarded with thank you letters and Certificates of Appreciation for their qualified work and their significant contribution to confidence and peace building process. Event was attended and recorded by the head of "STUDIA RE" Mamuka Kuparadze and journalist Maia Shonia.